Multilevel marketing organizations (MLM's) have gotten a little bit of a bad rap. However, just like "junk" bonds really aren't junk, as in garbage, but have a place in the financial market for the right investor, MLM is simply an approach to familiarizing people with and selling a product. Of course, the MLM is only as good as the people and the product who stand behind it. 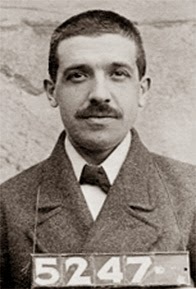 Charles Ponzi: Would you buy a foreign postal coupon from this man? Since Charles Ponzi promised clients a 100% return in three months through foreign postal coupon arbitrage, which in fact was using the money from later investors to pay "dividends" to early investors, hence "Ponzi Scheme," people have been suspect of MLM's. Incredibly, unscrupulous marketers seem to be almost as numerous as dupes considering Bernie Madoff swindled billions of dollars from people who trusted him. Still, I remember in the 1970's growing up in rural Missouri a kid my age whose father, already a successful business manager, had become an early Amway distributor and made a fortune over decades. I didn't know Amway from my elbow, of course, but I did notice that money wasn't something my friend's dad seemed to worry about. As far as I know, the guy who now has to be more than 80 years old is still reaping the yield from the seeds he planted almost half a century ago. Male Avon Lady Douglas Ruffhead: What's he selling? distributors generated sales of almost $30 billion in America. Worldwide, some 92m distributors grossed $154 billion." In addition to Amway, some of the better known and more successful MLM's include Avon, Isagenix, Mary Kay, Melaleuca, Shaklee, and The Pampered Chef. Many of the sales processes include meetings or "parties" during which products are displayed and demonstrated while participants drink wine or cocktails while socializing with friends before buying products. I've often wondered how successful a guy could be as an Avon or Mary Kay representative. Anyway. According to that same article in The Economist, only 0.14% of one company's sales team earns more that $20,000. That's not many and that's not much. So, the bottom line is, I think, before getting involved in an MLM, research the company to verify it is a legitimate sales organization that provides quality, in-demand products. Be realistic about financial expectations. In almost every case, representatives get the wholesale discount for products. Representing a product you like and use to earn a few extra dollars in spare time isn't a bad thing. While existing representatives may have a vested interest in discussing the benefits of one company's MLM structure, check the Better Business Bureau and, heck, even do a web search that includes the company name and the word, "complaints," for example, "XYZ Company Complaints." For any smart single dad, that should be enough to get into an MLM for the right reasons and avoid becoming another one of Ponzi's dupes! Here's something just for fun: I helped a friend get an Affiliate MLM Program, AdNavigator/AdZimple, off the ground in 2013. This, for better or worse, is the evidence.